Are you looking to get some good photos of your son’s or daughter’s basketball games? Maybe you want to photograph your city’s hockey team in action on the ice? Or a figure skating show? Whether on the ice or on the court, it can be tough getting good photos of indoor arena sports. After all, you’ve got to contend with sketchy lighting, your location in the bleachers, enthusiastic fans jumping up in front of your lens (or jostling your camera), and the speed of the action that you’re trying to photograph. Here we’ll give you some tips on how to bring home some good photos from the arena using hockey, figure skating, and basketball as examples to guide our discussion. This is the type of picture to avoid. Though a picture like this proves you attended the game, it really has little else to say. This is the problem if you try to take a picture from your seat way up in the nosebleed section of the bleachers using your SLR’s normal lens or with a point-and-shoot. Our opinion: Don’t waste your time. What type of picture are you looking for? A strong closeup action shot is much better. How do you get such a picture? Well, of course you would like to get as close as you can to the action. But here’s a problem. In Big League games, you’re not likely to be able to be offered a spot on the sidelines. Your best chance to get close to the action will be at high school and college games, not pro game. What do you do if you’re stuck in the stands at a pro game? Use a long lens like a 200mm or 400mm or longer. To hold it steady, use a monopod. But that’s not all! If you’re sitting in crowded stands, you may have a hard time getting the shot you want. That’s because every time something happens that’s worth photographing, the person in front of you is likely to jump up and block your lens. What to do? If possible, try to find a place in the stands where there’s no one in the row or two in front of you. You may be able to get an unobstructed shot. Even then you still may have a problem. You’re pretty far back and your strobe won’t reach far enough to illuminate the rink or court. What’s more, at most arenas no strobe is permitted. No strobe! One reason for this rule is that strobe might blind the vision of the players, especially if you’re shooting from under the basket, like in this photo. Unfortunately a large number of arenas do not permit you to take pictures even without strobe. They have a simple rule: NO PHOTOGRAPHS PERMITTED. Period! If this is the case, you’re completely out of luck. Put away your camera, and enjoy the game. However if cameras are permitted without strobe, you will have to shoot using the arena lights as your only lighting source. This means you should use fast film. Very fast film. ISO 800 or faster. And since you are most likely shooting action, you have to use a fast shutter speed. This is a tough combination. Think about it. If you’re shooting from way up in the stands, will even your fast film be fast enough to stop the action in your long lens? Let’s face it. Your 200mm or 400mm lens probably has a maximum aperture of ƒ/4 or even slower. And you want to shoot at a minimum of 1/125th or 1/250th to stop the action. So even wide open, your long lens may not be able to get sufficient exposure. We highly recommend that you check with your light meter before the game to see if you should bother to take any pictures. If the lighting is not sufficient for high-speed shots with your long lens, don’t waste your time or film. Now that we’ve outlined the problems, let’s not give up so fast. There are a few solutions. As we already mentioned, you have a better chance to get close to the action in a high-school or college game. Or a Little League game. Or a Goodwill game like the one pictured in this photo. Okay, you’ve been able to get into one of these “lesser” games and to set yourself up close to the action on the sidelines. Where should you position yourself? Most basketball action occurs under the basket, so this is where you want to be. But, beware! Those giant players often come barreling into the stands after a shot. If you’re in their way, you’re going to get clobbered! Our advice, position yourself behind the basket, but off to one side so you’re not in their line of fire. Hockey is different. Action occurs all over the rink, not just at the goal. In fact, if you position yourself behind the goal, you’ll rarely get to see anything but the goalie’s back. Our advice is to position yourself on the side, but toward one of the goals. From this position, you can get lots of action shots, like these photos here. Hockey has a problem you won’t find in basketball – generally, a glass panel is between you and the action. How should you adjust for this? First, look carefully through your viewfinder to make sure you’re not picking up much reflection. Since the arena is usually better illuminated than the stands, this may not be much of a problem. Second, however, if you are using autofocus, make sure your lens is focusing on the action and not on the glass. If it insists on focusing on the glass, turn it off and use manual focus. In this case, you are best off if you use a trick we describe in the NYI Course on Professional Photography, called “zone focusing” – that is, estimate your distance to most of the action you will be shooting, set your camera for this distance, and then don’t adjust it when you shoot each picture. This works especially well if you are using a small aperture – ƒ/8 or smaller – which will increase your depth of field. Now, let’s talk briefly about photographing figure skating. While hockey photos typically focus on the brutal moments in the sport, figure skating pictures typically emphasize the grace and athleticism of the skater. How can you best capture the spins, jumps, and fancy footwork of the figure skater? If you’re not ringside, don’t despair – you’re not in bad shape. Skating audiences are usually more polite than their counterparts attending hockey games, meaning there’s less chance that the person sitting in front of you is going to suddenly jump up and holler when the skater leaps and gyrates. Since photographing figure skating is often about catching the skater at the “decisive moment” (i.e., when he or she is at the height of a jump or other choreographed movement), we’d like to say something about the delay that most point-and-shoot cameras exhibit between the time you press the shutter button and the time the camera actually snaps the photo. This momentary delay occurs because the camera has to automatically set the focus, decide on the correct shutter speed and aperture to produce the right exposure, and determine whether you need a flash. While a second is not a long-time under most circumstances, it is far too long when you are trying to capture an action that takes place in a fraction of a second. Unfortunately, if you are using one of these cameras, you are likely to end up with a picture of a skater post-jump (or mid-fall) – assuming the skater is even still in your frame. The delay problem can occur with SLRs too if they are set to autofocus and autoexposure. Our advice then is that you use an SLR set to manual mode when shooting figure skating. And you should set your exposure and focus in advance so there won’t be even a millisecond delay when the right moment comes. How best to set the focus and exposure, you wonder? Pre-focus on an area of the rink. You won’t be focused for the action that occurs farther away, but skating routines bring the performer to your side of the rink fairly predictably. You’ll be prepared to shoot whenever the performer is in your pre-focused zone. 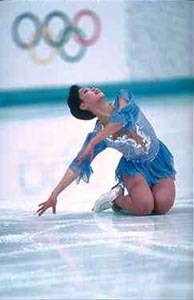 Whether you’re photographing figure skating or any other indoor arena sport, when you set your exposure, remember that you are aiming for correct exposure of the performer or players in the glare of the lights, not for correct exposure of the ice or the court or the spectators in the stands. Even if your seat is not ringside, we recommend that you walk down there before the action begins and take a reading with your light meter. Perhaps you can get a reading of your own skin in the glare of the lights. During the game or figure skating competition, try panning some shots by following the movement of the athlete as you press the shutter-button. A good pan will produce a sharp image of the athlete against the blurred background of the spectators. When panning, use a slow shutter speed – like 1/15th, 1/8th, or 1/4th – and keep the athlete in your viewfinder as you press the shutter-button. A monopod or tripod is essential for good panning. Don’t forget to look for reaction shots too. Many a great picture of tragedy and triumph occurs after play is over, like this one of the post-game celebration. Now if you’re going to a professional arena where you can’t get close to the action and you don’t have a fast-enough long lens, does that mean that all is lost? Maybe not. A day or two before a game, call the Public Relations Department of the home team or the arena. Ask for permission to photograph from close up before the game begins. They may surprise you and say “Yes!” And if you’re an NYI student, be sure to mention your NYI Press Pass. Some arenas will be pleased to honor it. NYI student Valerie Rothwell used to take photos of the Florida Panthers’ hockey games from her season ticket seventh-row seat. But after using her NYI Photoworld press pass to persuade the Panthers’ administration to give her credentials, she now shoots from the glass with the rest of the photojournalists to get great shots like the ones pictured below. Valerie’s experience shooting in the arena has taught her a lot about photography, including the qualities of different films. If the arena let’s you in before the game, you may be able to get some great shots of your players or skaters, even if they’re not in midst of competition!